Want tomatoes year round without buying them canned at the grocery story or growing them yourself? 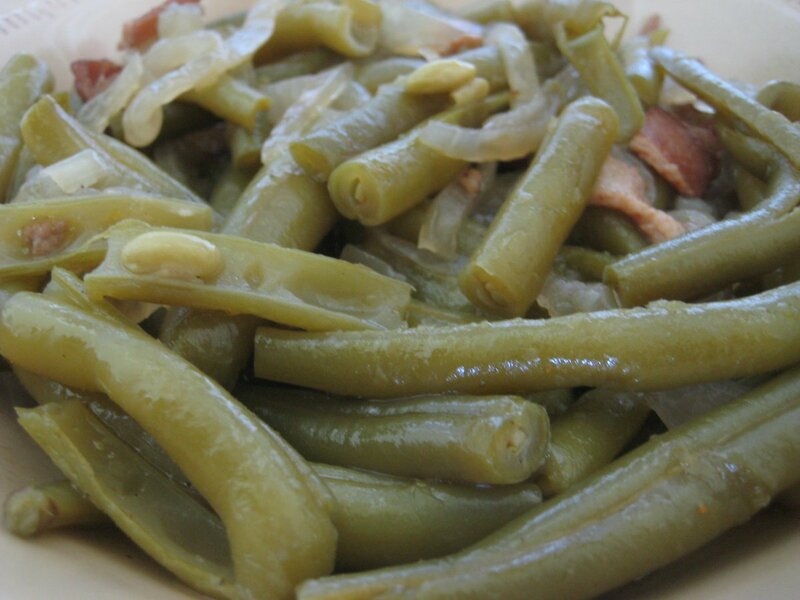 Then head to the local farmers' market or roadside stand at the height of summer. That's when you'll find boxes of seconds on sale at reduced prices. Seconds don't look as perfect as the tomatoes growers sell at top prices, but they're perfect for freezing or canning at home. The trick to getting the best price on seconds is waiting. When the hottest days of summer hit, tomatoes in the field ripen quickly, and prices drop dramatically. How cheap seconds will be depends on when you buy them and how well local tomatoes are producing. 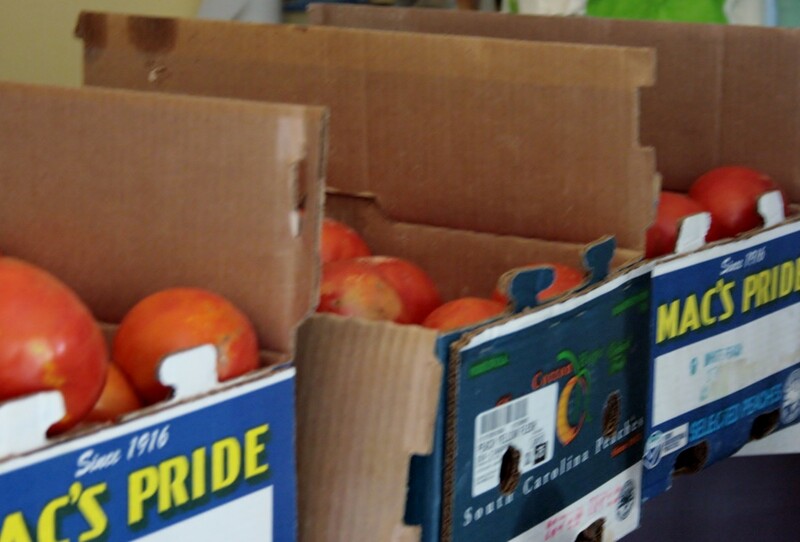 The first time we bought seconds, we paid only $5 per bushel box. 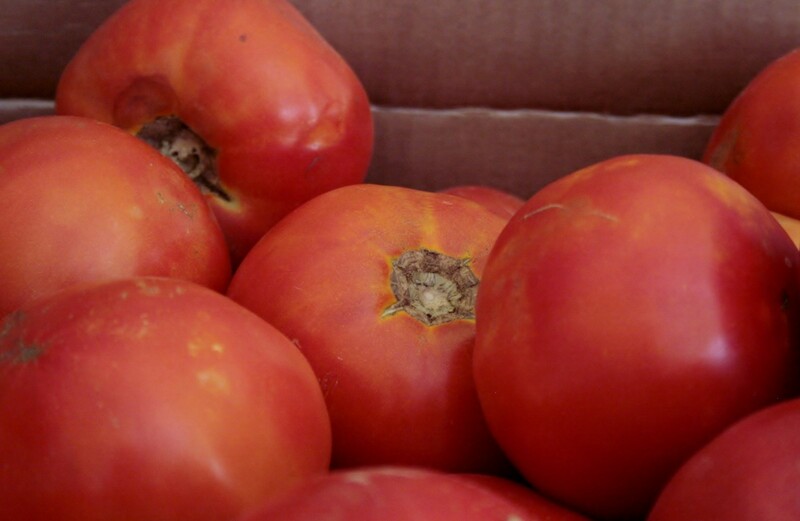 The second year, a tomato blight affected growers throughout Maryland, and we paid $8 per bushel box. This year, our usual supplier (a local Amish farmer) has had problems with his tomato crop. We switched to a different local seller and got three bushel boxes of beautiful seconds for $10 each. Although more expensive, they're such high quality with so few "bad" tomatoes, even at the bottom of the box, that they were well worth the price. 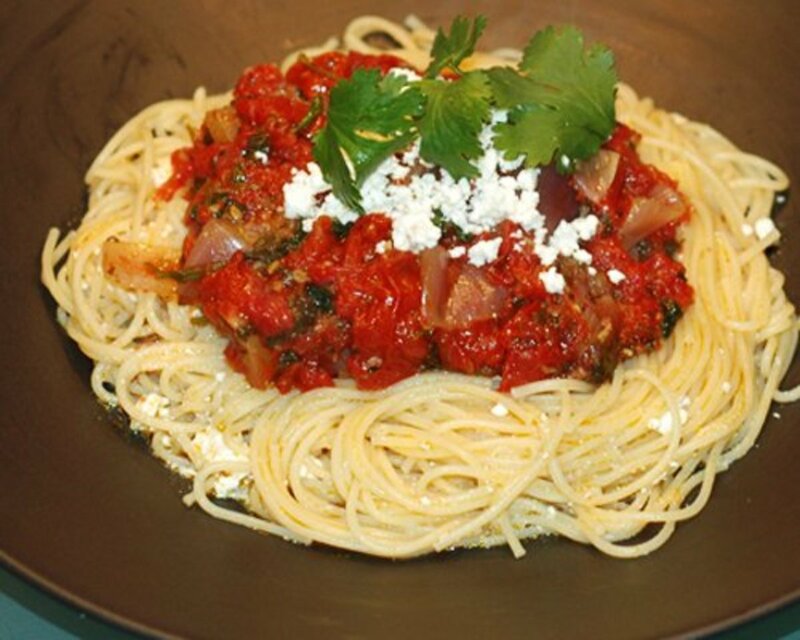 You can make tomato sauce, spaghetti sauce, even ketchup with seconds. Seconds are very ripe and often damaged, so they're time sensitive. You have to use them immediately. The easiest way I've found to "put them up" before they spoil is to freeze tomatoes in chunks. Prep Time: It takes about 4 hours (an afternoon) to prep and freeze a bushel of seconds. Yield: About 25 quart-size freezer bags of chopped tomatoes. Create a work area for yourself that includes a bowl for placing peels and cores, a large bowl for cooling blanched whole tomatoes and a large receptacle for the chopped tomatoes. 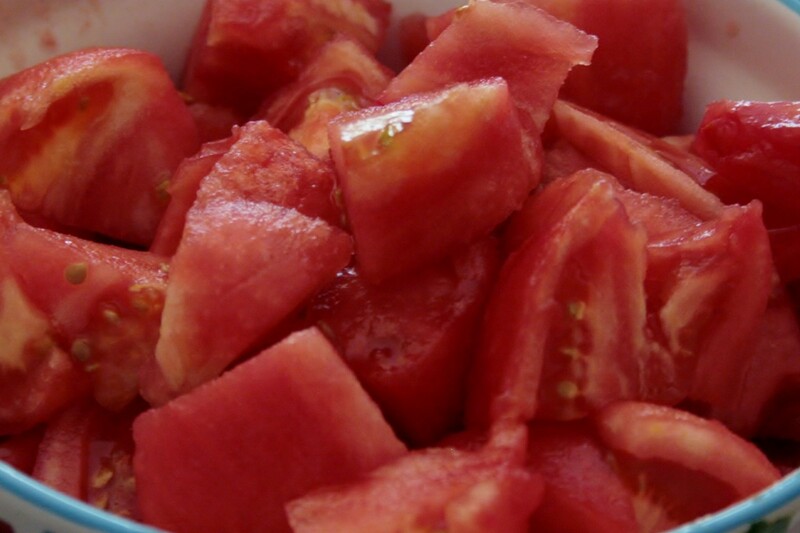 Wash the tomatoes in cold water. Because they're fresh from the fields, they'll be dirty. Expect mud, dried leaves— even a few bugs. Once you've rinsed them off, remove the cores. Once the tomatoes are cored, score them. Score the tomatoes by making an X across the tops & bottoms. 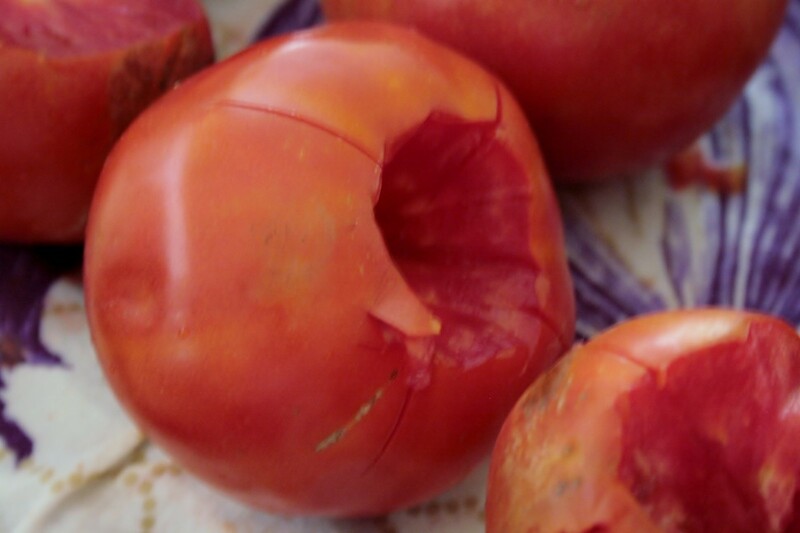 If the tomatoes are very ripe, you may be able to pull the peel away at this point. If the skin is still tight, you'll have to blanch the tomatoes to remove the peel. Scoring the tomatoes will make it super easy to remove the peel once the tomatoes have been blanched. Immerse the tomatoes in boiling water 15 seconds, then place them in iced water. This is called blanching. 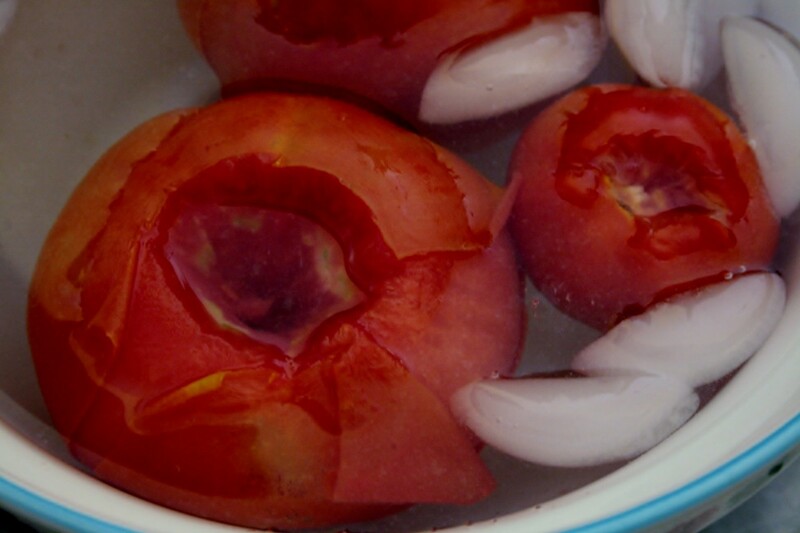 The purpose of blanching is to remove the skin, not cook the tomatoes. To that end, boil them briefly— 15 seconds tops— and then place them in cold water so they won't continue to cook. If you boil them longer than 15 seconds or don't immerse them in cold water, the meat under the peel will become mushy, and the tomatoes will be too hot to handle. 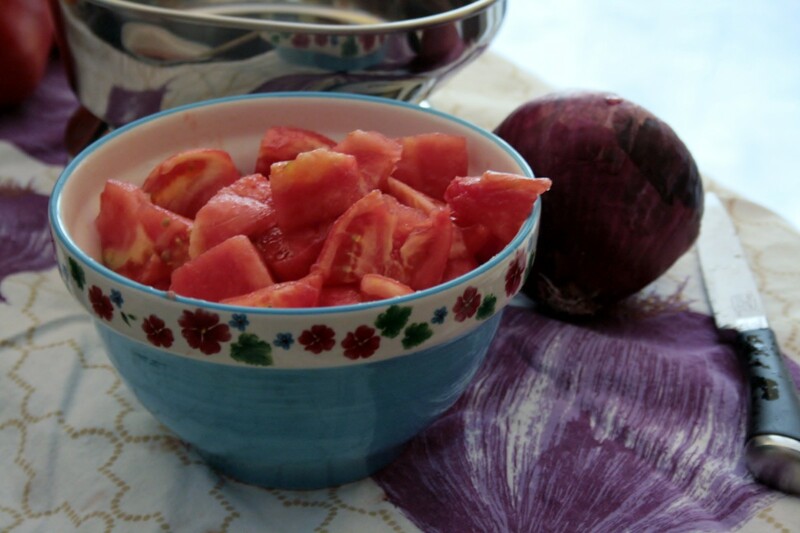 Discard the peels and cut the tomatoes into halves, quarters and chunks. Once the tomato wedges are a manageable size, cut them horizontally into bite-sized chunks ideal for sauces and stews. If you are going to remove the seeds, now is a perfect time to do so. 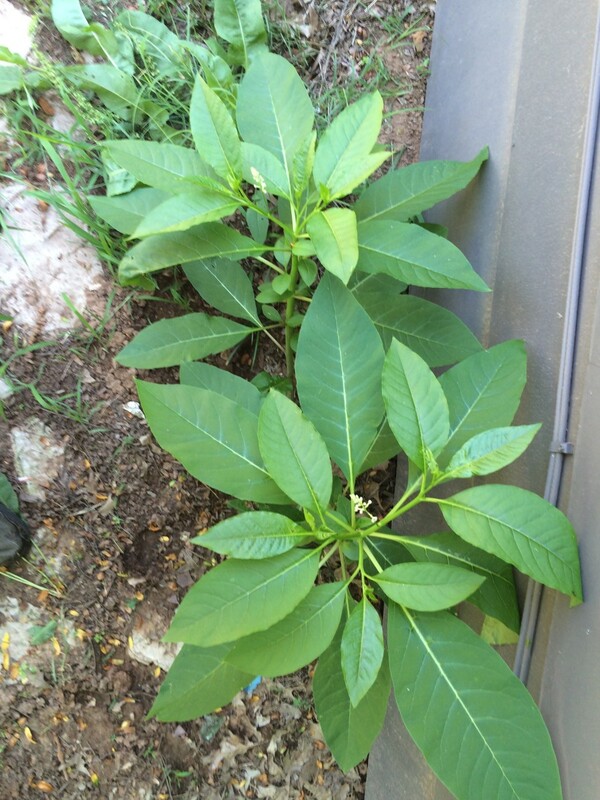 I only remove seeds that are either black or a bright green, as these are sometimes bitter. 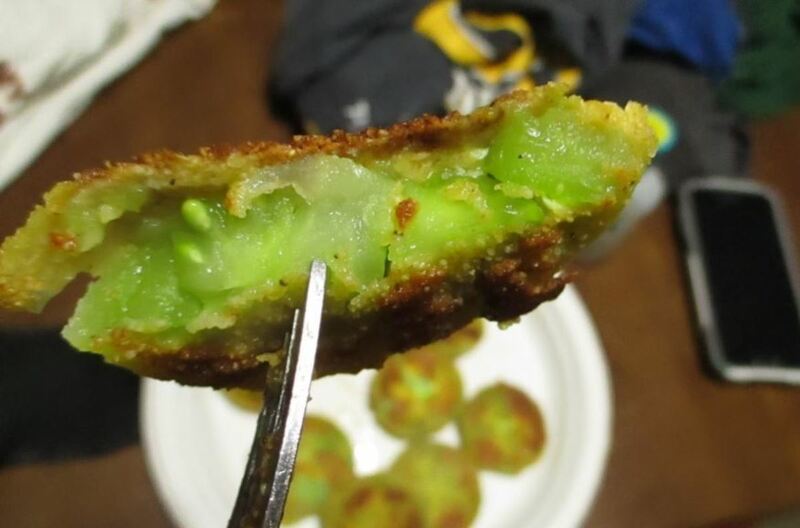 Place the chunks in freezer bags and seal. 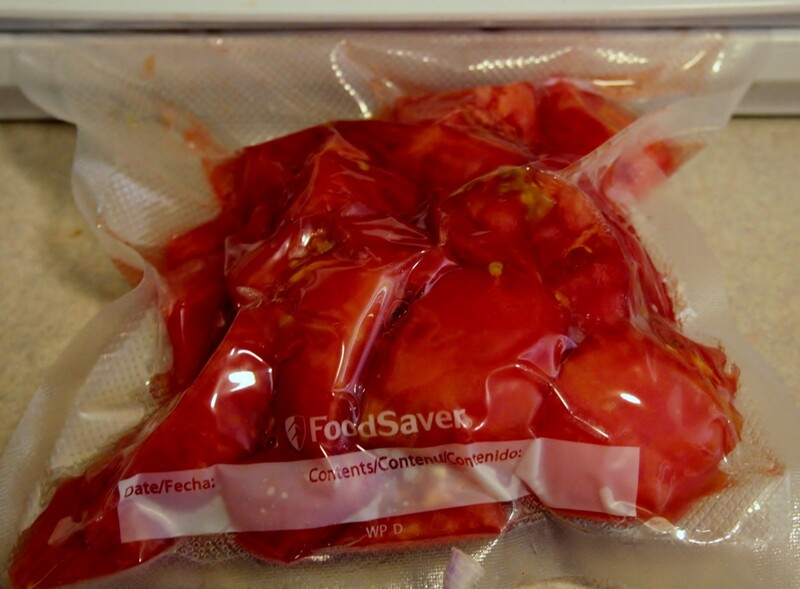 We use a Food Saver vacuum sealer, but you could also use plain freezer bags or jars. If freezing in Mason jars, don't tight the lids all the way and be sure to leave some room at the top, as the tomatoes will expand as they freeze. When the bags are cool, place them in the freezer. Use sharp knives. 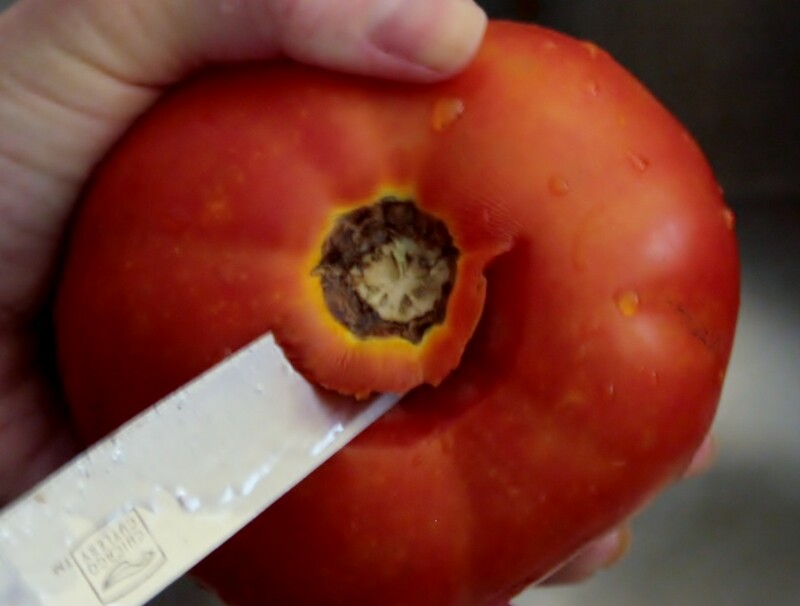 Your knife should slide through a ripe tomato like it's butter. If it doesn't, sharpen your knife. Otherwise, you could cut yourself. 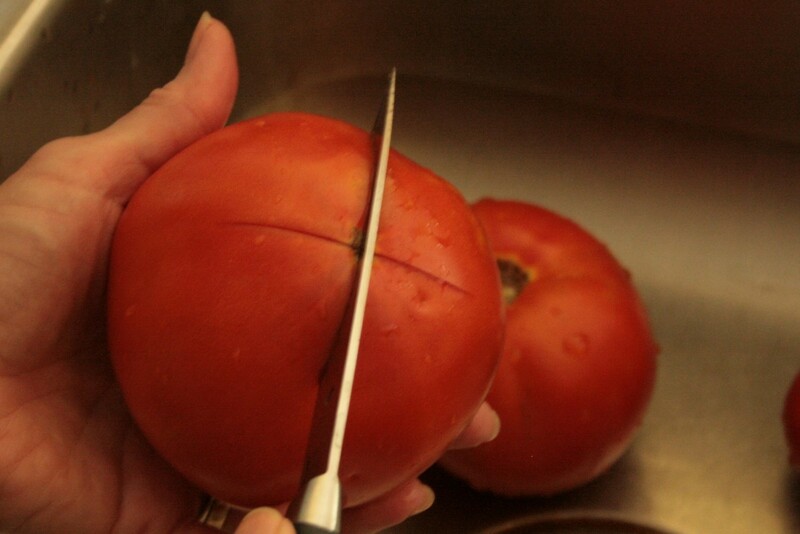 If you're not used to using kitchen knives, cut the tomatoes on a cutting board rather than in your hand. Begin with a clean, organized work space. Creating a place for peels and cores, a place for the bowls, etc., before you begin will make the process go much more smoothly. Work in batches. Because our kitchen is small, I find that if I do about six lbs. of tomatoes at a time, it's easier. Clean up periodically. After finishing a batch, dispose of the peels and cores, change out the water, sharpen your knives and wipe up. Reuse the water. Blanching uses lots of water, which I always feel guilty about, so I let it cool and then water outdoor plants with it or pour it onto the compost pile. Compost peels and cores. If you don't have a composter, you can bury the waste. It will enrich your soil. 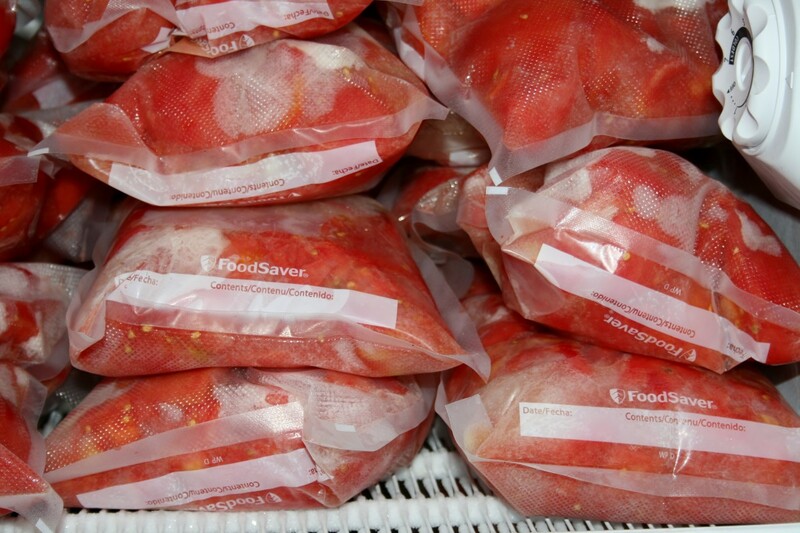 Frozen tomato chunks are handy to have in winter for soups, stews, pot roasts and sauces. And they're much healthier than tomatoes from a can. Although we go through the tomatoes we put up in summer by Christmas, with the Food Saver, they could last up to six months in the freezer. Very interesting. I'd never really thought to do this, although I do know how to blanch and freeze other veggies, and have done so in the past. Even if you're not freezing, you can easily peel tomatoes this way, or, even by stabbing a fork into the stem end, and rotating it for a few seconds over the stove burner (gas stove). The skin will tighten, and 'pop,' at which point the fruit can be iced and easily peeled. I don't have enough freezer space for this but I have canned tomatoes before and you are reminding me how good fresh canned salsa is! Great instructions on how to get a good deal on fresh tomatoes! Thanks so much for the help with freezing tomatoes. I think I like this idea better than canning them. Congrats on your HOTD! Jill, I'm stopping by here again to say congrats on HOTD, my friend. Well done! Hi Jill - Thanks for all these wonderful tips! I've always wanted to try to make my own sauce, but I was planning to grow my own tomatoes and can them. But I have horrible luck growing tomatoes, so my plan has always fallen apart. Love the idea of buying and using seconds. And thanks for the directions for freezing the cut tomatoes. Congrats on your HOTD and have a very happy new year! I've never done this before but your hub was so comprehensive and easy to follow, I think I might try it! (Just have to wait for the peak of summer.) I also like using local farm products. Great job and congrats on HOTD! A million dollar idea on saving money and enjoying tomatoes! Actually canned tomatoes will not last longer than a few months at any cost. But with the process described in the post, it is very much possible to get the tomatoes for the whole year. I love the detailed way in which the author has mentioned all the process. The most amazing this is that anyone can go on with the process just by following the steps! Just need to be a bit careful! Also these frozen tomato chunks are really delicious! To be honest my tongue is just licking seeing the images! Overall a great post for getting tomatoes all year around. 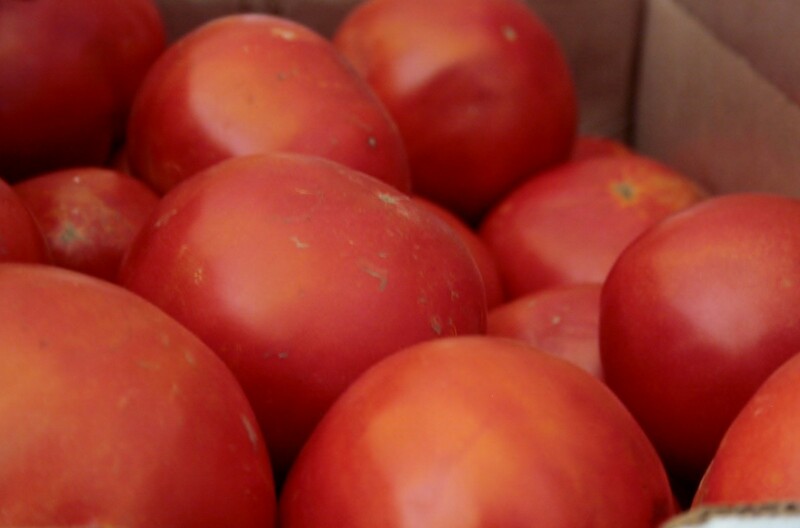 Great ideas on finding economically priced tomatoes. I enjoyed reading and seeing your method of freezing eliminating the need to do the canning. O, Jill, you are so right. 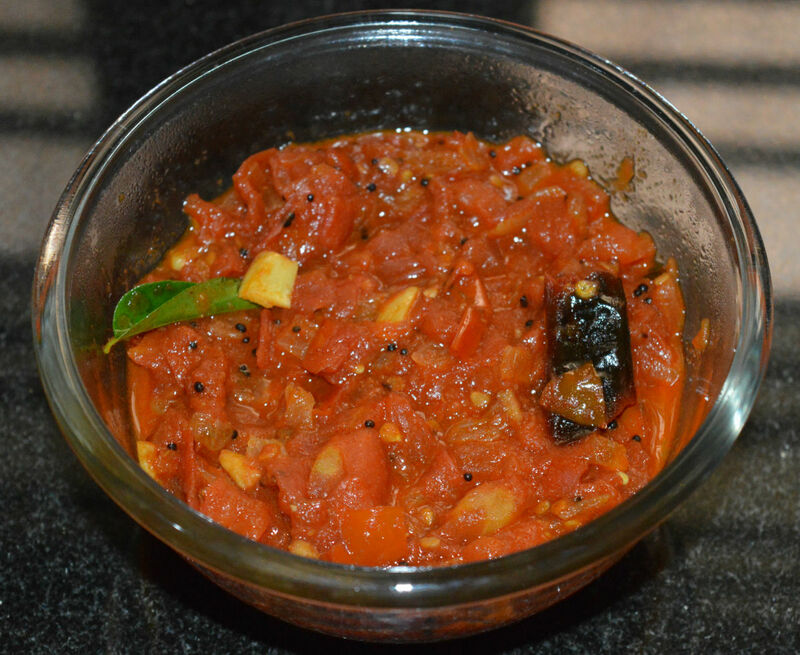 There is nothing like a 'fresh' tomato in winter or any time for that matter. My friends led me to the discovery of buying large quantities and then preparing sauce or freezing them.. I love fresh, home-grown tomatoes! 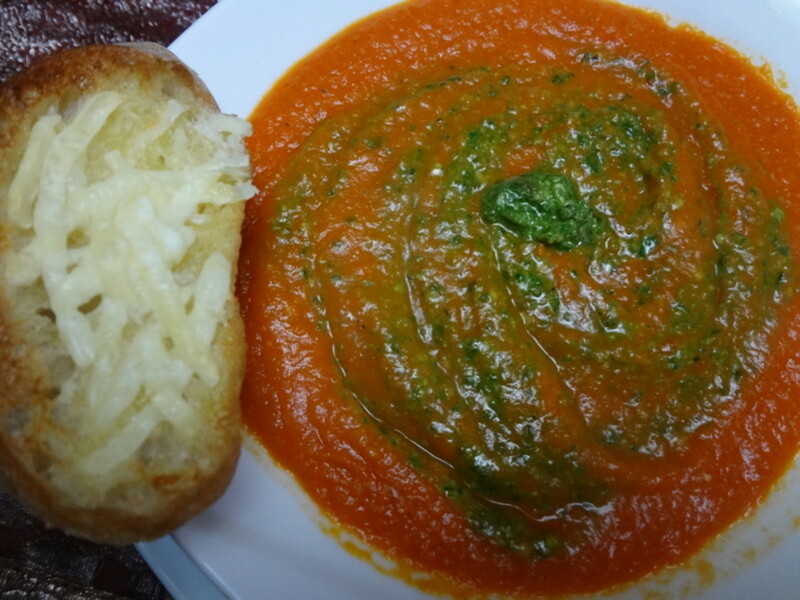 We grow our own and make picante sauce, stewed tomatoes and spaghetti sauce with them. However, this year we didn't get very many tomatoes and I am very disappointed. I hope that next year our garden will do better. I grow way more tomatoes than I can use, but I usually can them. Sometimes my husband makes big batches of spaghetti sauce from them. Those he freezes. What a great idea. And those seconds are really cheap! Canned tomatoes have become quite expensive and this way you know what you are getting as you've done it yourself. Every year, we have a couple days when we get a whole lot of tomatoes from my husband's veggie garden. I keep the nicest ones to eat fresh, but freeze the "seconds" to use in sauce. I go to weekly markets and buy tomatoes and other vegetables for the week. The problem we face here is excessive use of chemicals and fertilizers. I miss the good old days when I helped grandma make cans and cans of sauce and the sauce was so good! I never froze tomatoes before, something to consider next time I head to the farmer's market and get lots of tomatoes. Thanks for sharing. Terrific review! Two thumbs yup! Hi moonlake. Thank heavens for farmers' markets, huh? Have fun! Excellent hub. I can see why it's an Editor's Choice pick. Love the photos and detailed instructions. Thanks for posting them. We've had such wet weather here earlier this summer the tomatoes aren't so nice, but we have farmers markets around so I may just go buy a bunch and do this. Very useful hub. Hope your garden and flowers are thriving! Thanks for the info, Lee. I would like to try that. Ms. Dora, thanks for stopping by. Hope you get some tomatoes to freeze. Hi Lee, I love the idea of drying them and grinding them into a powder. Do you use a dehydrator or just a low oven? Your hubs are always interesting. I've been freezing tomatoes for a while now but I find I can dry tomatoes and freeze those to save a lot of space. I use them just like you would use frozen chunks but they absorb a lot of moisture which can help some recipes. otherwise just add water. Another thing I have discovered is to dry the tomatoes until absolutely dry and crispy, then I grind them to a powder in a spice grinder. The resultant powder I use where I want tomato paste. I still keep the powder in the freezer to avoid mold. My last tip is for the seeds and skin you remove before processing. I only just tried this so I don't know about quantities but I put the skins, juice and seeds in with chunks I am cooking for tomato sauce or puree. When the sauce is well cooked I use the food processor to puree and the skins and seeds just disappear into the sauce. Jill, what a clever idea. No grown tomatoes in my neighbor. Maybe as a future container plant idea or buy them at local farmer's market. Voted up for useful! Voted Up! Very helpful and sensible. Thank you very much though I may not be able to buy them here by the bushel. 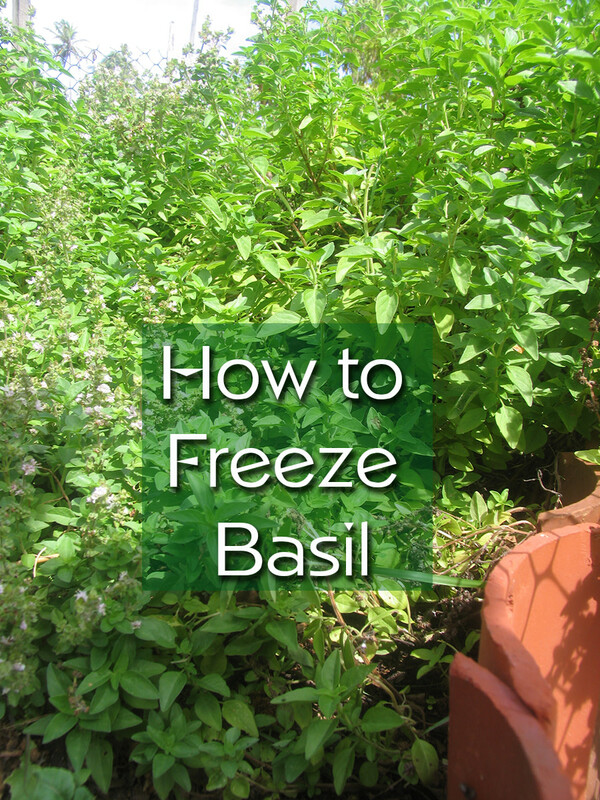 Preparation for freezing seems easy enough. Thanks! I have both a bumper crop of tomatoes and a vacuum sealer. However, I am out of bags, and can't afford any replacements, so, bummer! I am the only one who eats tomatoes; my husband can't stand them (unless in the form of ketchup or chunk-free spaghetti sauce), so a single plant is more than plenty, and more than I can eat. I am constantly donating extra tomatoes to my daughter or neighbors! I had not thought of using canning jars in the freezer, though; I do have some, but not very many quart sized ones. My wife and I use the local farmers' markets as much as possible. Love this idea because it allows us to enjoy their tomatoes year round. Nothing can beat a fresh tomato. Wow, we have tomatoes growing here as well, and I never thought I'd have to worry about the squirrels getting into them. It's enough that I have to chase off the deer. Thanks for a great hub.